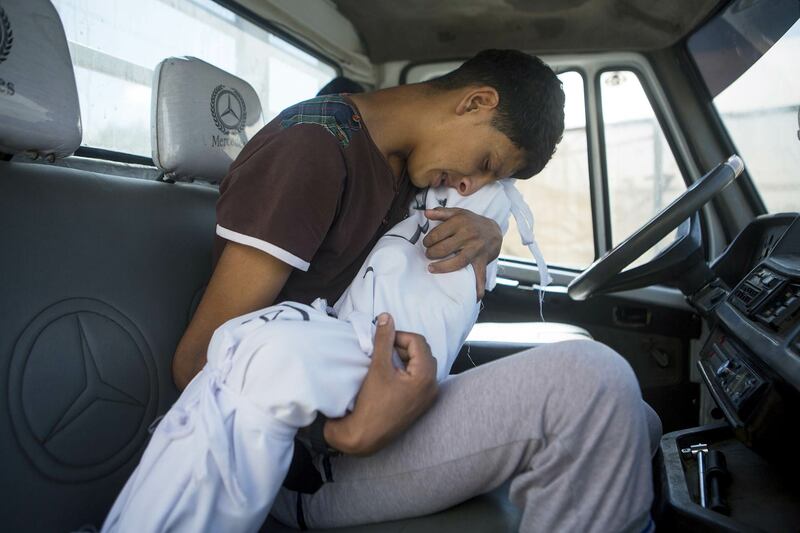 During the 2014 Israeli assault on the Gaza Strip, 142 Palestinian families lost three or more members. Some of the families were wiped out entirely. The #ObliteratedFamilies project tells the stories of some of these families, their loved ones who were killed and those left behind. Zakiya Maadi woke up from her afternoon nap. The house shook violently and the room filled up with smoke, rubble and dust. There was blood dripping from her head, but she managed to push the rubble off her and run downstairs to start checking on the others. On the way down, she heard her children screaming that Ismail, her son, was dead. There was nothing she could do, besides keep going to find others, those still alive, who could be helped. 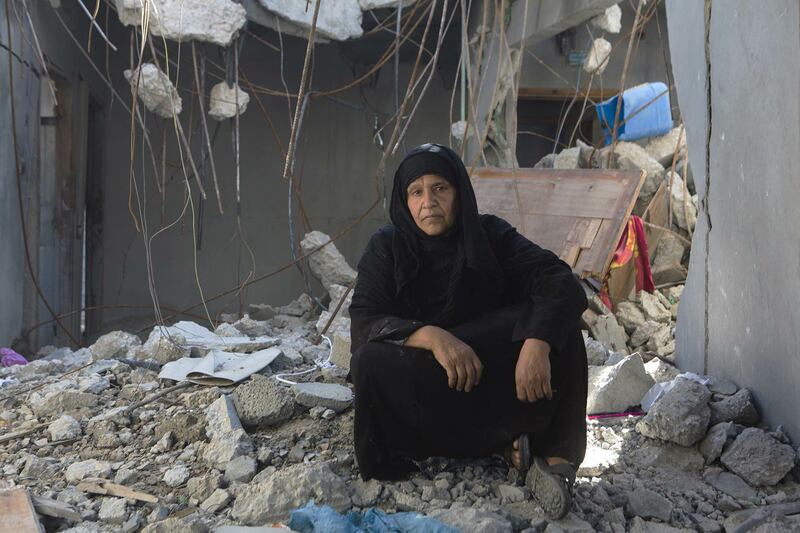 Zakiya Maadi, 58, mother of seven boys and four girls, in the ruins of their bombed house. When his name is mentioned, Ismail looks up. He is sitting on a thin mattress, in the corner of a living room where, a year after the attack, the family gathers to recount the events of Black Friday. Although everybody thought he was dead, the neighbours rescued Ismail, now 20 years old. His skull was crushed, and he was left with neurological damage. Ismail dropped out of school, where he had been studying to become a licensed mechanic. Now he just waits for the Rafah crossing to open, so that he can leave Gaza, but he doesn’t have much faith that it will happen any time soon. Salem, Zakiya’s husband, father of the family, asks Ismail something, but his son seems absent. Salem repeats the question, but the boy doesn’t answer. When the bombing happened, everyone thought that Ismail was dead. “His skull was crushed, he was clinically dead,” says his brother, Mohammed. Ismail is still recovering physically. “He is better now, but he needs another surgery for his leg,” his mother adds. 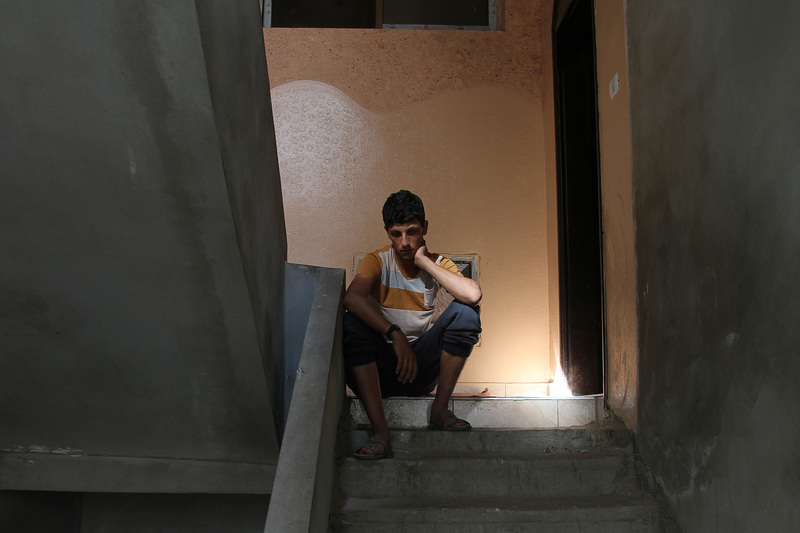 Mohammed, Ismail’s younger brother, also dropped out of school. “The boy is broken,” Salem says, adding that he dropped out just before his final high school exams. “I spent all my life in that house,” Mohammed says, “but screw that house.” Zakiya scolds him, but with a patient smile. She is a bit embarrassed by this outburst in front of strangers, but also understanding. She gestures, turning her hand next to her head, as if to say that her son’s mind is not at peace. “I don’t care, they can destroy this house, I just want my brother and his girls to be alive,” he continues. Mohammed is talking about his brother Bassam, his wife Iman and their two daughters Hala and Jana. Two more members of the Maadi family were killed in that airstrike: two-year-old Yousef, son of Mohammed’s brother, Ahmed, and Suleiman, Mohammed’s uncle, who died a week later in Egypt, where he was sent for treatment. Photos of Zakiya’s son, Bassam, his wife Iman and their two daughters Hala and Jana. Two other members of the Maadi family were killed in that airstrike: two-year-old Yousef, Zakiya’s grandson, and Suleiman, Zakiya’s brother-in-law, who died a week later in Egypt, where he was sent for treatment. Zakiya, who is 58 years old, but looks much older, says they are tired and it is painted all over their faces. It is in their voices, especially in their absent looks, but also in the heaviness of their movements, as if their hands and legs were made out of lead. It seems like they have given up, and it’s only a lack of choice that keeps them going. The prospect of having a new house has not lightened them up; they seem almost oblivious to the on-going construction. 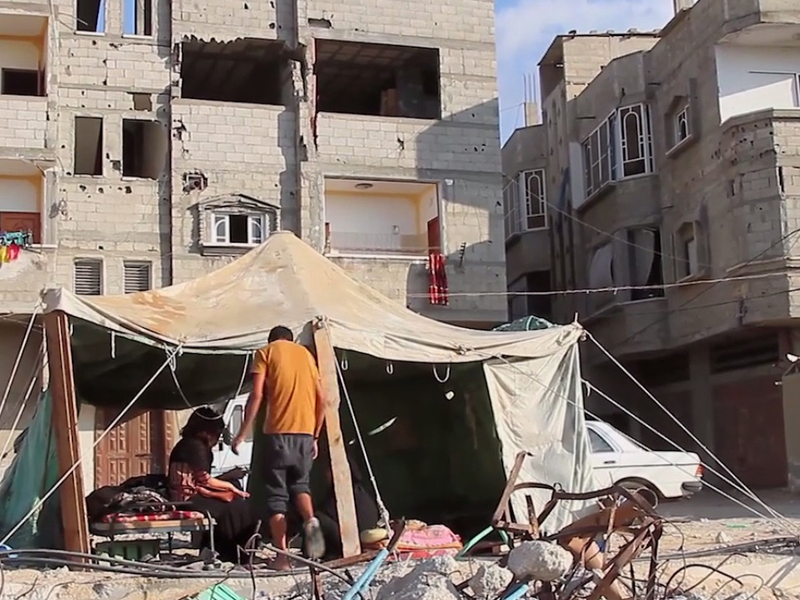 The Maadi family was one of very few to have their house rebuilt after the Israeli offensive. They are among the 300 families who received support from the Qatari National Committee for the Reconstruction of Gaza. Unlike them, the majority of people whose houses were bombed are still waiting today for their building materials to enter the Strip. They return to the story. It was Friday, 1 August, the day which would come to be known as Black Friday. A ceasefire was supposed to start at 8 am. Instead, the Israeli army launched the Hannibal Directive, enacted to thwart an attempt at taking an Israeli soldier prisoner. That day, all hell broke loose over Rafah. 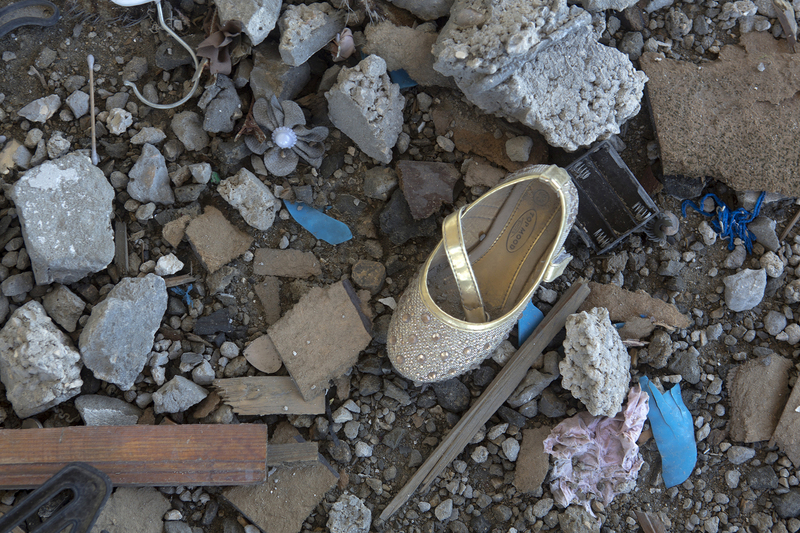 Still, the Maadi family felt safe, as their house was outside of the area that saw most of the bombing. There were 31 people in their big family home that Friday. Zakiya and Salem had even called one of their daughters earlier that day and told her to come over, thinking that their house would be a safer place. She brought her kids, and the whole family ate lunch together. Afterwards the women sat inside the house talking, while the men continued their conversation outside. Only Bassam went back in, to be with his wife and girls. Iman was pregnant: they were going to have twins. Bassam was a university graduate, but farming was what he loved. He worked at a local farm in Rafah. His work was a lot like his father’s – during the 70s and 80s, when Israeli agriculture relied heavily on cheap Palestinian labour, Salem had picked vegetables on Israeli farms. Bassam had kept his job for 17 years. He got up every morning before 6 am, and came back home to Iman and their two daughters, Hala and Jana, after sunset. He always remembered to stop by his parents’ flat to drop off groceries and check in on them. Zakiya smiles when she says that Bassam was the quietest out of the seven sons and four daughters she had with Salem. Bassam was kind, but preferred to keep to himself, or spend time with the sheep and ducks that the family had. That Friday, many of Salem and Zakiya’s sons, daughters and grandchildren gathered in their big house. Yet it was impossible to pretend that there were no F-16s roaring above their heads, or to ignore the echo of artillery shelling. One of the uncles started to speculate as to how many of their relatives would be killed in this war. And this is when the bomb fell on them. Rubble of the Maadi house. Neighbours, despite the risk of a second strike, ran to help them. Zakiya and Bassam’s wife Iman, along with her two daughters, were sent off to a hospital on the back of a truck. As soon as they reached al-Najjar hospital, the main medical facility in Rafah, Zakiya was separated from them. She was in a state of shock, blood was still dripping from her head, but she insisted that her granddaughters were the first to be attended to. Zakiya saw more bodies piled up on the floor than people still alive. She was running around the corridors, filled with the dead and injured, searching for her two granddaughters. As Zakiya went around the hospital, people stopped her to tell her that she had blood all over her head. She didn’t care. The doctors told her: “We are evacuating. Whether you can run or not, run; there is no time.” The hospital had to shut down and evacuate the patients and medical staff, under threat of being targeted by Israeli fire. People fled in panic once the shelling came closer to the building. The bodies of her daughter-in-law and granddaughters were taken in an ambulance to another hospital, and Zakiya, like everyone else, fled the hospital. Black Friday photos, copyright private. When the bomb fell on the Maadi house, the Hannibal Directive was in full swing. The ambulances were busy picking people up from the south-eastern areas of Rafah. No one expected a house so far from the combat zones to be hit. It took the paramedics more than 20 minutes to arrive. In the meantime, a Palestine TV car that was in the area started to evacuate people to the hospital. Salem, together with Bassam and his grandson Yousef, were in the TV car; when the driver heard the news that al-Najjar hospital, where Zakiya went, was being evacuated, they drove instead to Kuweiti hospital. Salem was holding his grandson Yousef close to him when they arrived. The Kuweiti hospital was not prepared to handle so many injured, they usually had two beds in the emergency room. There was no bed to put Yousef on. “I was surrounded by my family, everyone hurt, some nearly dead,” recalls Salem. Yousef and Bassam were evacuated to the European hospital. Both Salem and Zakiya wanted to follow them there, but the roads were closed, as the hospital was too close to the areas still being bombed. Bassam died at 2 am that night, Yousef before that. “They told me to go home. But I didn’t have a home to go to anymore.” Salem finally gave up. Only when he was on his way back from the hospital and drove by the rubble of what used to be their home did he realise that they were the main target. “I built this house for my children in 1986,” says Salem. He worked in the Israeli agricultural sector to save money for this house. 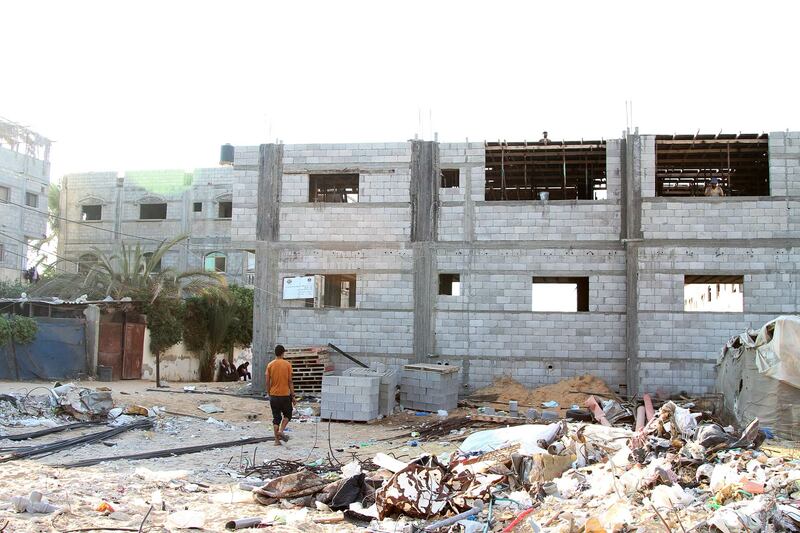 A year after it was bombed, the rubble has been removed, and a new house is being built on an adjacent plot. The remains of those killed also had to be sent to various different places. The morgues were full to the point that hospitals had to coordinate with owners of vegetable coolers and even small ice-cream freezers, to turn them into temporary storage spaces for the remains of those killed during the Black Friday onslaught. The bodies of Iman, Hala and Jana were eventually sent to a small hut in a remote agricultural area of Rafah, a walk-in flower cooler, left over from Gaza’s once blooming industry of freshly cut flowers sold for export. It was not a freezer, but still better than what some of the hospitals in the area could offer at the time: an ordinary room, with bodies lining the floor, and fans running on full speed, trying their best, yet unsuccessfully, to diffuse the smell of decomposing remains. The family wanted to bury Yousef, Bassam, Iman, Hala and Jana together. Two days after the attack, on Sunday, the bodies of Yousef and Bassam were returned from the European hospital. The bombing had eased off since Friday, but the fields where the flower cooler turned morgue stood weren’t deemed safe. 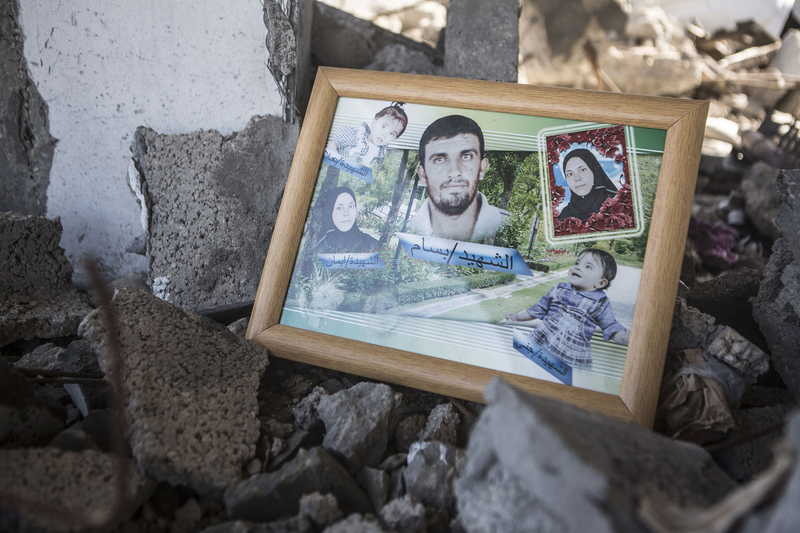 The Maadi family tried to secure a coordination, meaning a sort of guarantee that they would not be bombed by the Israeli army while they went to collect their dead. Salem called the Red Cross and they told him that the military hadn’t cleared the area where the flower coolers were, and that they couldn’t help. Neither of the hospitals were willing to send their ambulances to that area. This hut in a remote agricultural area of Rafah houses a walk-in flower cooler turned morgue. It is left over from Gaza’s once blooming industry of freshly cut flowers sold for export. This is where the bodies of Iman, Hala and Jana were placed. 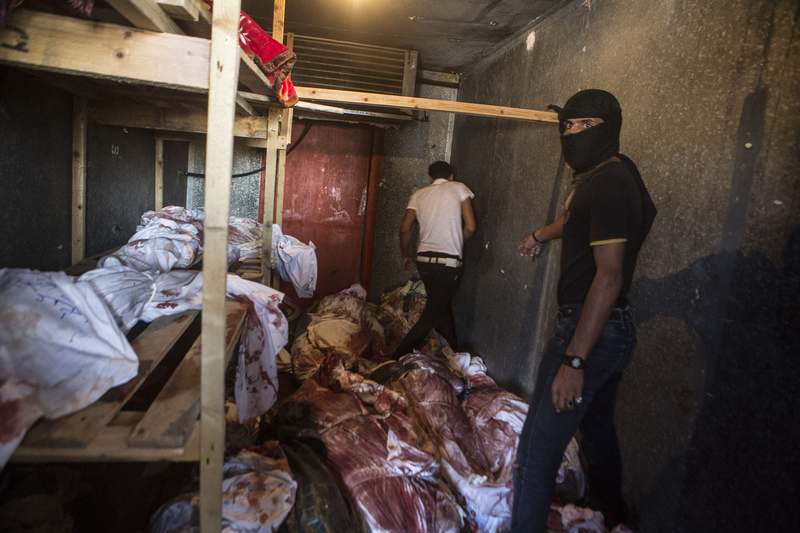 “So we went to get the martyrs ourselves,” Mohammed says. Everyone was afraid. The air was still thick from the tension. A group of men, Mohammed among them, drove in the family truck to the small flower cooler where bodies, wrapped in blood-stained white sheets, were placed. Many were on the floor, some on hanging shelves. People rushed in and out of the flower cooler. The smell of decomposing bodies in the summer heat was unbearable. Mohammed seized Jana’s body in his arms and didn’t let go of her, not until he put her in the ground. Zakiya wakes up from a nap. Her sons are gone again. Every afternoon they leave the house to go to the cemetery, to visit the graves of their brother, his wife and daughters. She asked them to stop going there every day, but they don’t listen. 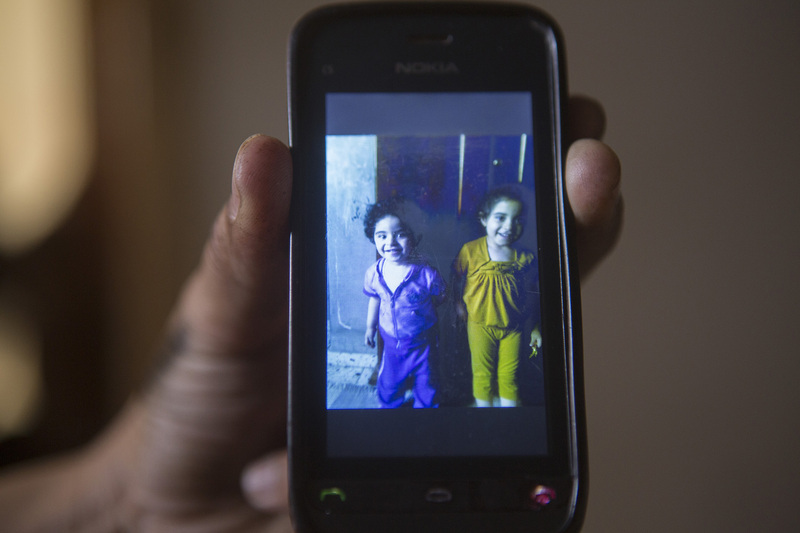 Photos of Hala and Jana, Mohammed’s nieces, killed together with their parents in the Israeli airstrike on the Maadi house. The Gaza Strip is part of the Palestinian Occupied Territory; together with the West Bank and East Jerusalem, it has been under Israeli military occupation since 1967. 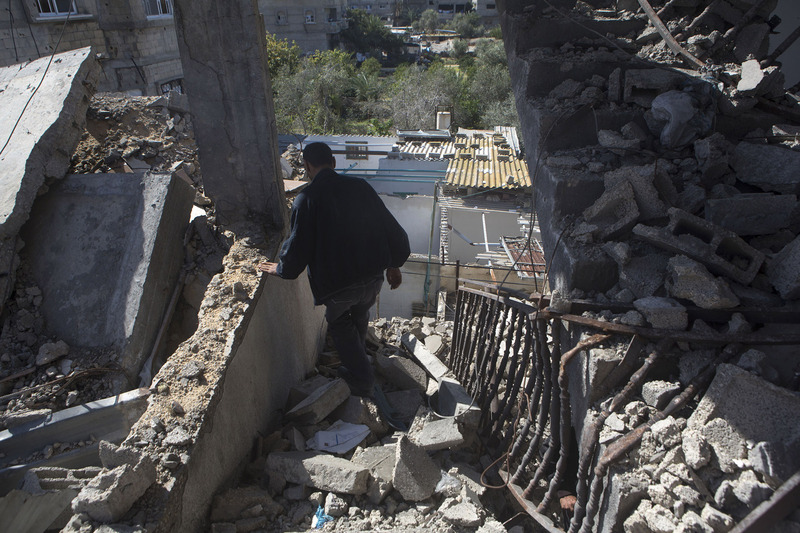 More than 70% of Gaza Palestinians are refugees, forced to leave their homes in the lands grabbed by the nascent state of Israel in 1948 and forbidden from returning. The Gaza Strip is a tiny Palestinian enclave, just 360 km². It is one of the most densely populated places in the world. The siege imposed by Israel and enforced by Egypt turned this place into the world’s largest open air prison. 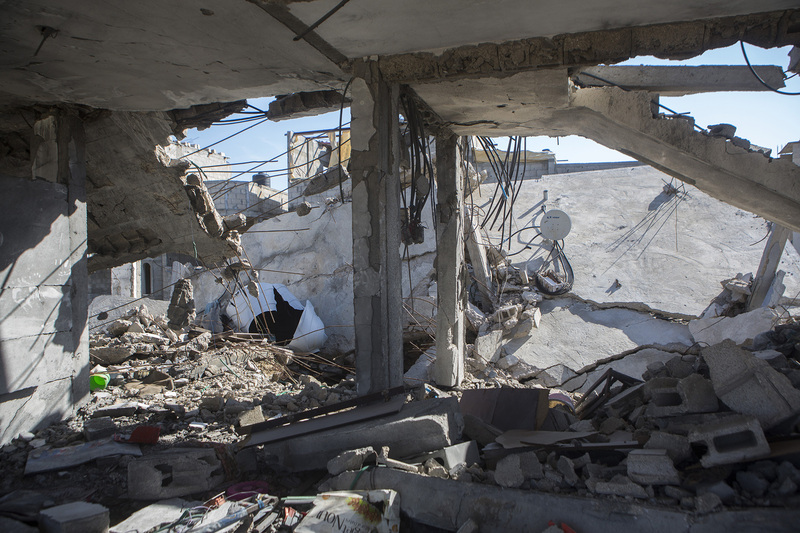 2014 summer’s 51-day long Israeli assault from land, air and sea left the Strip in ruins and 100,000 Palestinians homeless. 2,200 people, the vast majority of whom civilians and nearly a fourth of whom children, were killed; more than 11,000 were injured; and at least 1,000 children were permanently disabled. This entry was posted in MRSCP by admin. Bookmark the permalink.